As I've mentioned a few times, Instagram is one of my favorite social channels for artists. It’s ideally suited for creatives whether you’re sharing your own work or looking for inspiration. Plus, it’s quite simple to use. The challenge comes in setting yourself up for success, but what does that mean on this platform? As an artist I imagine your long term goal is making a living off your work, be that through selling pieces, getting commissions, showing in galleries or at events, etc. But first you must be discovered which is one of the best things Instagram can offer. If you use make full use of features at your disposal, you'll have the greatest likelihood of Reach and Engagement, the cornerstones of Instagram success! The most important element of any good Instagram post is the creative because it’s the first thing people see. Your goal is to share something that grabs your audience's attention. I've heard Instagram employees call this "thumb stoppingly good creative" because it gets people to pause instead of scrolling on to the next post. You only have a few seconds to make an impression. While Instagram started as just a channel for images, you now have a lot more options to choose from in creating content: Single Image or Multiple in a Carousel format (up to 10), Videos, ranging from clips up to 60 seconds to Boomerangs and Time Lapses. Instagram has created a handful of additional apps for creating these unique types of content, but you can also use others to make your own little graphic designs. Check out these tips to get creating. Once you've chosen what to post, you have the chance to customize the look with editing tools and filters. Over time, most successful Instagramers develop a visual style that makes them easy to recognize. That consistency in look and feel adds to the professionalism. At the very least, the images and videos should be good quality, and taking the time to tweak contrast, color, etc. goes a long way. Take time to play around with the options so you know what look fits your work. Learn more here. The job of your visual is to get people to stop. Then the caption gives context to what you're sharing. What's going on in the post? Why is it relevant? What do you want people to do in response? Even a quick description can help connect with the viewer who has taken the time to pause on your post. Reward them for their attention. Ask them for input. Thank them for following you. Share more details about your process so they can feel like them know you. I'm sure you've heard it said that "people buy from people they like", and this is your chance to make virtual friends at a large scale. Do you want your content to be seen by more than just your followers? If so, always include hashtags on your posts. They are the best opportunity for getting your posts in front of more eyes because that's how people discover content that's relevant to their interests. 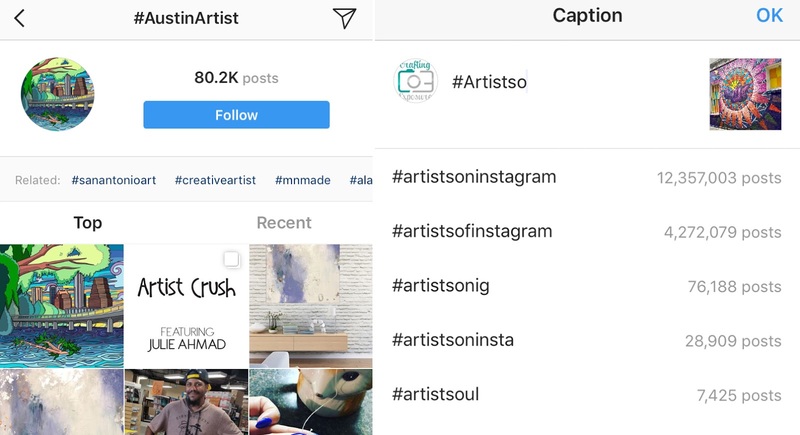 Instagram just recently added the option to follow hashtags like you would people so those posts automatically starting showing up in your feed, but you've always been able to search for posts based on these keywords of sorts. You can include up to 30 hashtags, but you really only need a handful that are the right balance of popular and relevant. You may want to come up with a set list of hashtags you'll use on most of your posts to save time. These should describe you as an artist and your work in general. Then specific to each post, you will add relevant tags about the subject matter. For example, all of your posts might include something like #AustinArtist #LandscapePainter #ArtistsofInstagram. Then you'll customize a few more for the particular image like #LakeAustinLandscape #PennybackerBridge etc. You can make anything into a hashtag, and as you type it in, you'll see how many other people have used that one. It's usually best to pick ones that have some use because you can assume that people will be following that content. Of course, that doesn't mean you can't use hashtags for a humorous effect when applicable. If your post includes other people or businesses, you have the opportunity to tag those accounts so they see the content. Plus, this is a great way to give credit where credit is due. If you're lucky, those other accounts may share your post and help extend your reach (using an app like Repost). Mentions work in a similar way except you are including them in the caption instead of on the actual image. When someone else shares your work, if they take the time to tag or mention you, you'll get a notification, and that's a great way to keep an eye on the conversation happening around your art. This is why many artists have signage asking you to tag them if you share a photo. Similar to hashtags, adding a location to your posts makes it possible for people to find content related to a specific place. Say for example you're searching for a restaurant or a nature hike and you want to know what to expect. You can find content that people have organically shared about these spots. This is also a way of adding the context that I mentioned above with captions. Let people know where an event is happening or where your art can be seen so they can find it. Thanks to the GPS on your phone, Instagram can suggest locations based on where the image was taken, but you can also search or customize to your needs. Follow these steps if you need to create a new location. Last, but definitely not least is the engagement your post is getting. This is shown as Likes, i.e. Hearts, and Comments (although if you have a business account, you will get even more metrics). The more engagement you get, the most reach your post will be rewarded with thanks to Instagram's algorithm. The first step to getting interaction is good creative and relevant hashtags that help people discover you. The caption then has the chance to let them know why they should care and even the occasional chance to ask people for their engagement. Be sure you take the time to respond or at least acknowledge comments so people know you're listening.